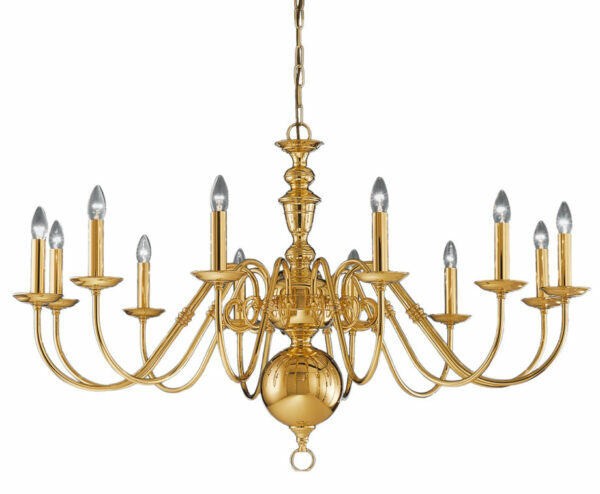 This Franklite Delft 12 light large chandelier in polished solid brass boasts traditional Flemish style. Constructed from brass, with 14cm ceiling cup, chain suspension and central baluster. Twelve double curved arms feature candle style lights, with metal candle pans and matching candle tubes in classic style. A large height adjustable traditional light fitting that will enhance your large hallway, living room or dining room ceiling. There are matching fittings available in the Delft genuine brass lighting range, please scroll down this page to view. Please note: This is a large chandelier with a diameter of 122cm and requires a large room and high ceiling to be shown at its best. Please ensure that you have the required space prior to purchase. This quality light fitting is supplied by Franklite Lighting who have been one of the pioneers in the design, manufacture and distribution of high quality lighting such as the Delft 12 light large chandelier in polished solid brass with Flemish style you see here.